As a teacher, I’m constantly assaulted with ads and promotional materials for “pro-quality” solutions for studio gear for schools. Companies assume that most teachers aren’t gearheads, and don’t pay a ton of attention to the equipment they’re buying, so long as it works well. This gives them a huge opportunity for overselling, and potentially costing you to exhaust your budget on items you don’t need, or that could have been much cheaper. Too many schools overbuy, and I think a big contributor to our school’s successful program is my absolute resistance to the idea. Here’s an example my students like to make fun of: At a convention performance, the kids got a chance to walk around the trade show. They saw this “AMAZING” video production hardware that cost around $15,000. I’ll bet a lot of your schools own one. They came to me and asked “wait – how much is our stuff, because this thing’s reel looked exactly like what we produce in our tiny little studio. The Tricaster is generally used for mixing multiple camera sources and performing a chroma key (green or blue screen) to replace the background. Additionally it can do overlays of pictures and text. 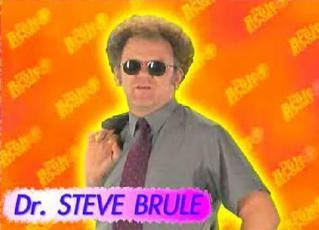 You know, your basic Steve Brule stuff. By this point, I was sending home a laptop with a student every night so they could do the editing as homework. They would deliver the laptop back to me early the next morning, and we’d show the announcements to the school. I didn’t like this setup, because sometimes the students either a) couldn’t do this or b) didn’t do a good enough job, and there was no time to fix problems. 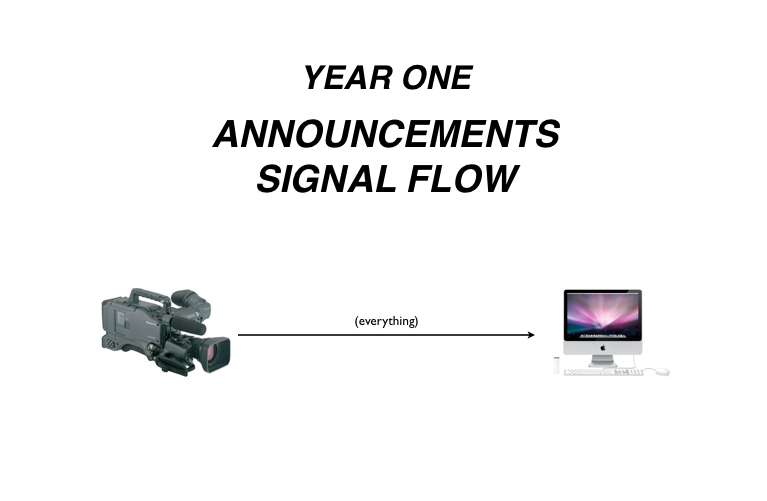 So year three was all about cutting back on the amount of post production needed. This meant eliminating one of the rendering processes. Since we can’t avoid the final render, I decided it was time to get a video mixer capable of chroma key. The cheapest machine of this type on the market to this day is the Roland V-4. It costs $1000, and is really designed for VJ’s, or news anchors who like their transitions to be synched to a song or something. This saves us time by recording the background along with the anchors, and still gives our editors (who work the following class period) the freedom to choose music and pictures. 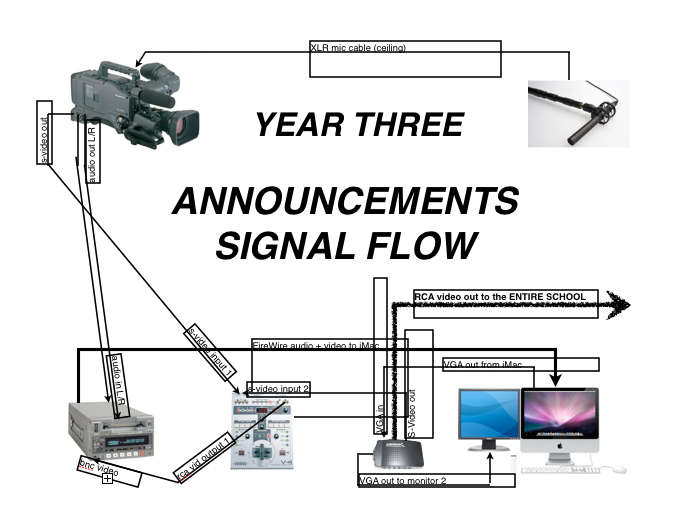 The fatal flaw with both this setup and the Tricaster is the lack of true HD support. Everything that runs in and out of the V-4 is SD quality, so even if we upgraded to an awesome camera it would still get downgraded to SD in post. Not that it’s a pressing issue right now, since our closed circuit system would do this anyway. But let’s say we upgraded cameras tomorrow. How would we do this? HD video mixers are extremely expensive, and are not something I’m interested in buying. 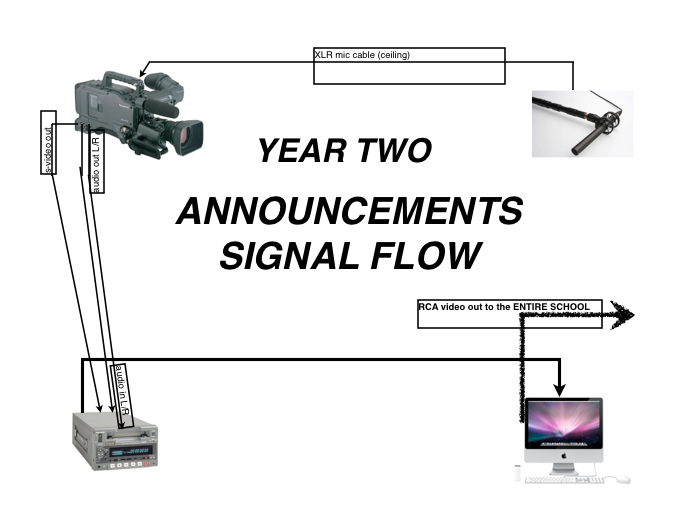 I’ve thought about this, and for now it seems the best solution would be to go back to year one’s signal flow and change to something like BoinxTV for doing chroma key and overlays. Three years ago, our computer wasn’t powerful enough to run Boinx without hiccups, but when we do get a new camera, we’ll definitely have the horsepower to handle Boinx. So, for a studio that started with a Streamgenie and DVD-RAM for recording daily announcements, we’ve done a lot of upgrading with very little money. Don’t let any salesman tell you that high quality school video is only doable for over $10,000 – always start simple, buy equipment that goes up to your ability level, and you won’t fall in to the “overbuying” trap.